Sports brand Nike is opening pop-ups in cities in the US and Canada and hosting a range of activations to mark its fourth annual Air Max Day. The 'Sneakeasy' shops aim to provide a focal point for Air Max celebrations, showcasing Air Max models from the past and present, while providing visitors access to the best retro and new footwear products. The first shop debuted in New York yesterday (20 March) and is running until 26 March. Here, visitors can view a Department of Nike Archives Air Max genealogy display and be one of the first to access the Air Max Day NikeiD builder, which aims to trial sessions for the future of air – the Nike Air VaporMax with a pre-ordering opportunity and exclusive access to the NYC Revolutionairs. This weekend (25-26 March), additional consumer activations will launch across Nike stores in New York City, at Nike Soho, NikeLab 21 Mercer, Nike Flatiron, Nike x Kith, atmos, Bandier and Concepts NYC. The Toronto pop-up will open for one day only, on 25 March, and will feature a curated experience by Director X, alongside interactive displays created by six Toronto visionaries that creatively bring to life three decades of key Air Max milestones and silhouettes. Additionally, the Nike Air Max Bus, a mobile experience celebrating 30 years of Air Max, is currently hitting the streets of Toronto, and will travel around until the 25 March, carrying a collection of Air Max 1 grails and a genealogy of Air installation. Select participants will have the chance to unlock one of the coveted silhouettes being brought out of the vault at its original price, or win a ticket to the Sneakeasy. 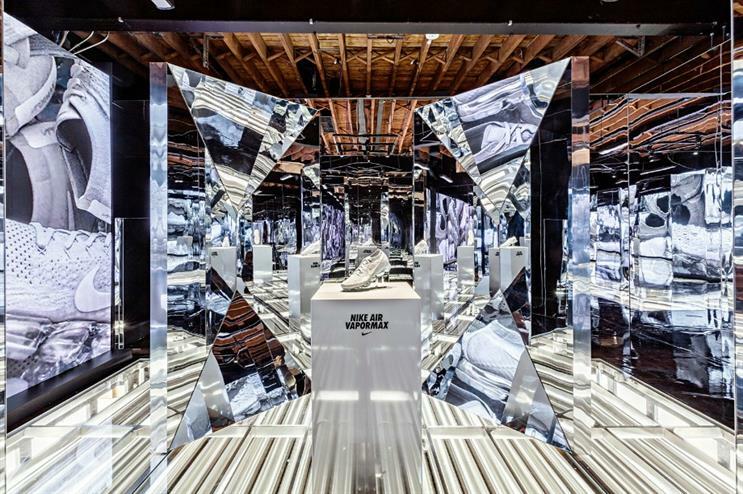 Other pop-ups are being hosted in Chicago - open on 25 March, it will showcase the past, present and future of Nike Air with local art installations, while the Los Angeles pop-up, also opening on 25 March, will celebrate the concept of 'air' in various form. To be able to visit the various stores hosting the pop-ups, potential guests are being asked to follow Nike on social media channels or sign up online at specific microsites tailored to each event. In December, Nike Lab opened two new stores in Tokyo and Chicago, with both featuring immersive elements.